If you were to ask me what was the best place I have been to on vacation I would tell you Santorini, Greece. Of all of the Greek islands it is one of the most popular. 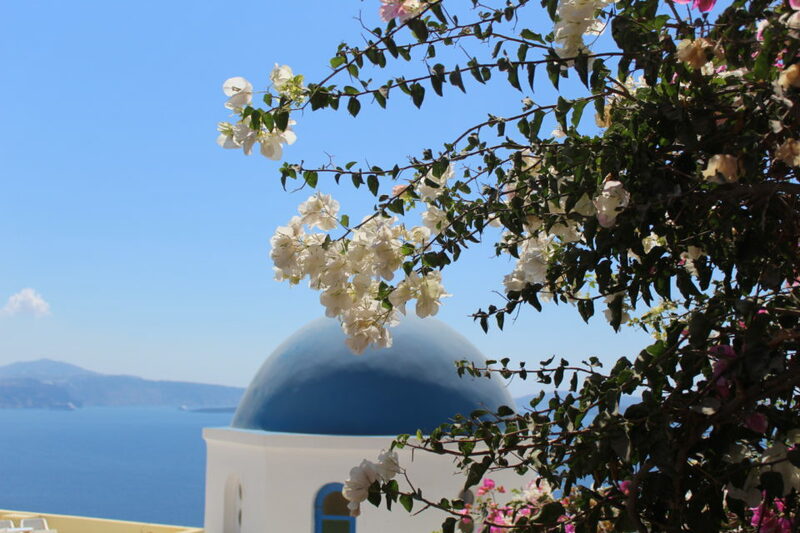 Santorini is what you imagine Greece to be – the white buildings with the pretty blue roofs, windmills, cliffs, the beautiful Aegean Sea surrounding it. It is a little spot of Heaven. Not only is it picture-esque and romantic, it also has a lot of different types of activities for people so it really appeals to various groups. I first visited Santorini 2 years ago on my vacation to Greece. It was the first island of our stop and was my favorite. I guess I am a little biased too since I have so many good memories of the island. When we first went 2 years ago we stayed in the main town Fira which is the capital of the island. It is also the busiest “town” of the island. It’s where you find many shops, restaurants, bars and hotels that line the cliff of the caldera. We only stayed for three nights the first time we visited. 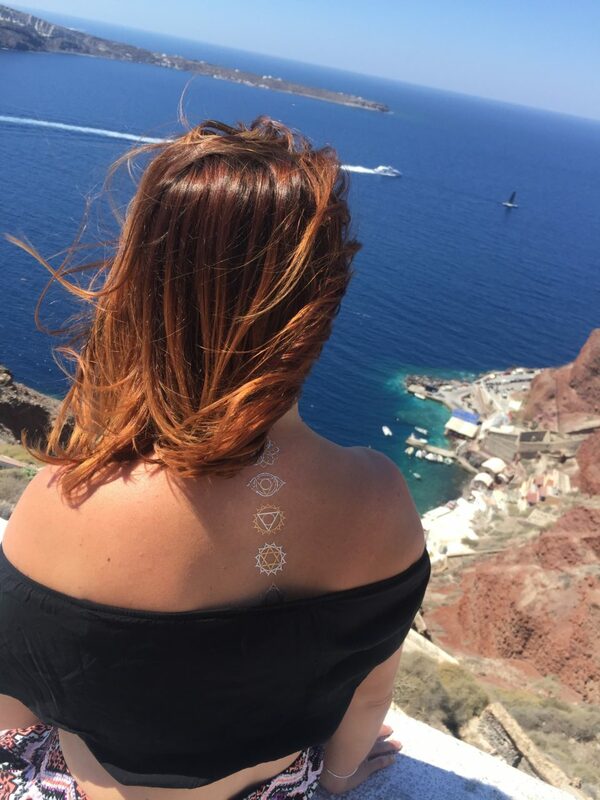 When we started planning our Euro Trip 2016 we knew we would love to go back to Santorini. 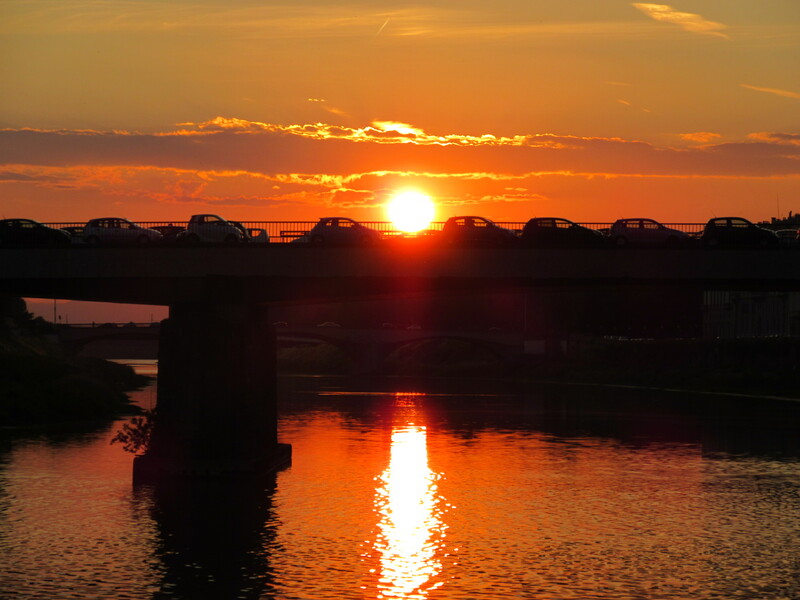 We had planned going to Croatia and thought well we are almost that far east we might as well add it to the itinerary. This time we decided to stay for 5 nights so we could really relax and soak it all in. Santorini is a very easy island to get around. The public bus system is great. They have air-conditioned motor coaches that take you from city to city and run all the way through midnight so you can really explore the island. You can also rent quads which is a fun experience but can be a little intimidating driving with all the the big buses. We also found getting cabs quite easy as well. It’s nice to have options so you don’t feel stuck in a certain part of the island. 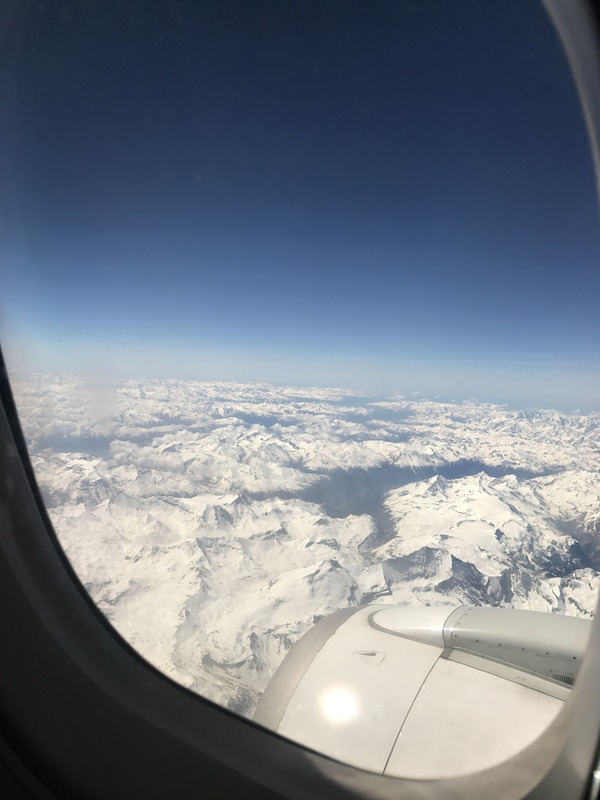 My husband and I broke up our trip in Santorini this time. We decided to stay two nights in an area of the island called Akrotiri so we rented a car for those two days which allowed us to explore parts of the island we had never been to. Between the two times we have been we have done a lot of different things on the island. We have done the typical things that you should do as a tourist on the island and we did some not so traditional things. We saw the sunset in Oia on our first trip however, we had advice from a local to not stay in the town because it gets overwhelmed with tourists and he was right. Instead we hiked down from the city to this little port called Ammoudi Bay which has a lot of less busy, had less touristy restaurants and a different view of the sunset (and if you happen to be so lucky, an AMAZING spot to get proposed to!!). We also visited the black beaches and the red beach which are definite to-dos on the island. 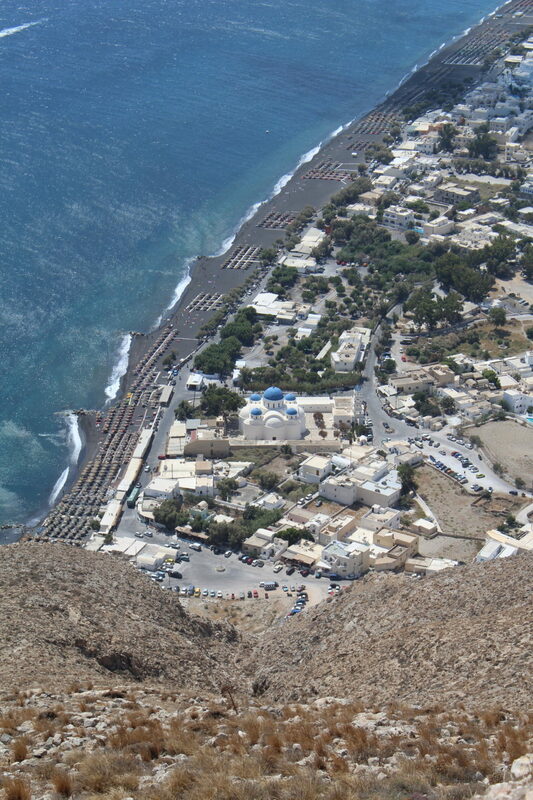 In Fira you can take the cable car down the cliff side and then ride donkeys up it. Or you can take the cable car down and if you want a 20 minute hike/work out and climb back it up it! This trip we did a few less touristy things. Santorini actually has ancient ruins at the top of one of the highest points of the island called Ancient Thira. The ruins date back to the 9th Century B.C. The road to get up there is an experience in itself. It goes back and forth up the mountain with really sharp almost 90 degree turns. There is a bus that you can take to the top, we did see some people hiking the road, we saw some people on quads, then there were the crazies like us who drove our rental car up it. Most spots of the road were only large enough to take one car at a time and most of the time you were right up against the edge of the cliff. I am afraid of heights so this drive was not necessarily my cup of tea. I was white knuckled the whole way yelling at my husband to go slower. Once we got to the top though the views alone were worth it. It was interesting to see the island from that perspective. Santorini also has a few museums on it. One museum that caught my eye as we were leaving the airport on our way to the hotel was the Industrial Tomato Museum. 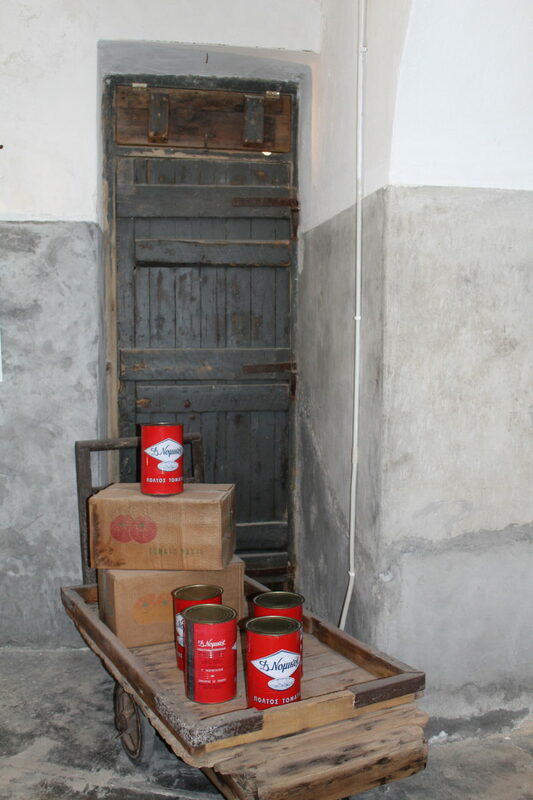 In the early 1900’s one of the first tomato paste production plants was created which expanded to canning as well. My husband and I both love to cook and this was an interesting find on the island to learn a little more about the history and the people. One of the ways we truly can learn about a culture is through their food and this was just another insight to how the island sustained industry before tourism became huge. Whether you are looking to relax, eat good food, or be adventurous this island really has something for everyone. It truly is a little slice of Heaven. 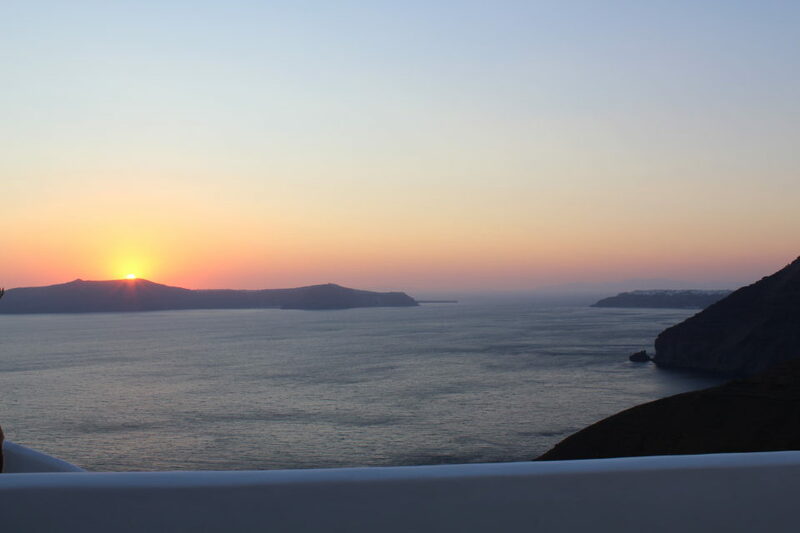 Watch the sunset every night – the sunsets in Santorini are amazing. Depending on the time of the year you can see it set right into the Aegean or even behind the volcano. It never gets old no matter where you see it from. If you choose to head to Oia which is known as the town to watch the sunsets in Santorini, take my advice from above and go a less conventional direction. Especially if you don’t like to be surrounded by huge groups of people! Visit the beaches – ALL of them – How many places can you say has a red, black AND white beach? Santorini does. The Red Beach isn’t really a traditional beach. The “beach” is at the bottom of a cliff of red stones and is pretty rocky. It is also a hike down to it but worth the scenery. There are not bars and restaurant at this beach so definitely take a backpack with you. The White beach is like the Red Beach but is only accessible via boat that you can catch from the Red Beach. 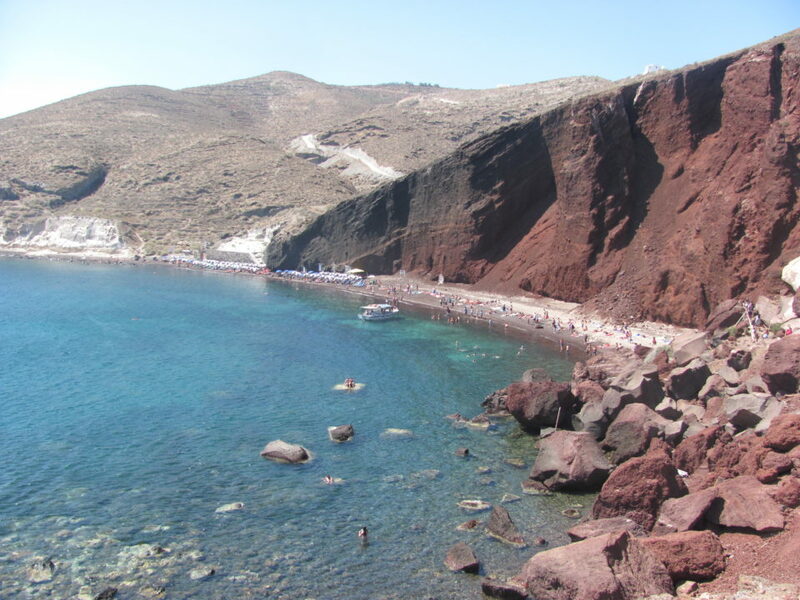 Santorini is a volcano so it’s no surprise that the beaches tend to be black volcanic sand. You can find them through out the island but the 2 I liked the most are Perivolos and Perissa, both have tons of restaurants with beach chairs that you can use if you eat and drink at their establishments. Take “Alternative” transportation – how often can you say you rode a donkey? Or took an ATV on public roads to the beach? The island has several spots you can rent four wheelers for the day. There are several different towns that offer donkey rides as well. It is not uncommon to see donkeys and their guides walking through the streets of the island. Eat like a local – Greek salads are not the Greek salads you have probably experienced in the US. Real Greek salads do not have lettuce and they definitely don’t have “Greek” salad dressing on them. They are simply dressed with a little drizzle of olive oil and sprinkled with fresh oregano. Try a frappe while you are there which is a Greek iced coffee (and is fabulous!). Moussaka, tzatziki, soulvaki (grilled meat), spanakopita and octopus are just a few that you will find. Don’t be a typical American and find a pizza place or eat a burger, try the local cuisine, experience their culture through their foods. If you MUST then I highly recommend french fries dipped in large quantities of tzatziki! 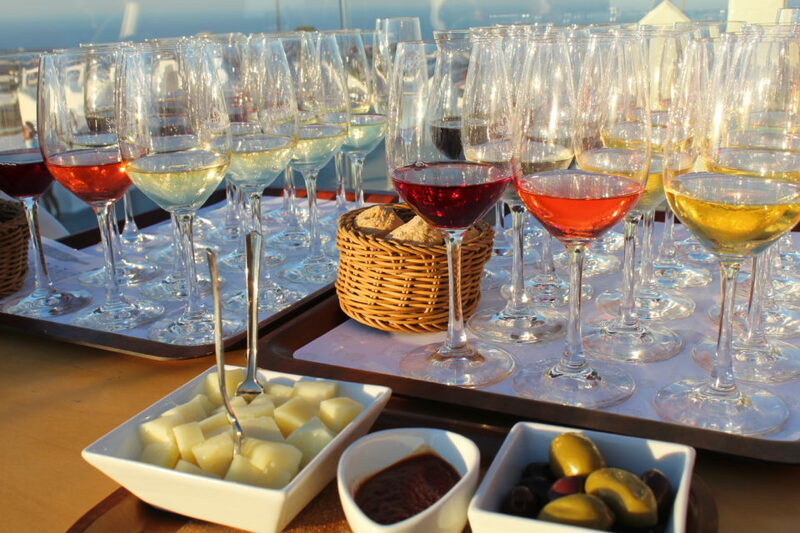 Visit a winery – Santorini has several wineries on the island. We visited Santo Winery while we were there which has an incredible view of the Caldera and of the sunsets. Make a reservation before you go so you can be sure to get a table closest to the ledge. The wines in general in Santorini are hit or miss. You either like them or you don’t but the beauty about a winery is you get to have a tasting to figure that out! We tended to drink more whites or rose wines while we were there. The reds have a strong mineral flavor (in general) from the volcanic soil. 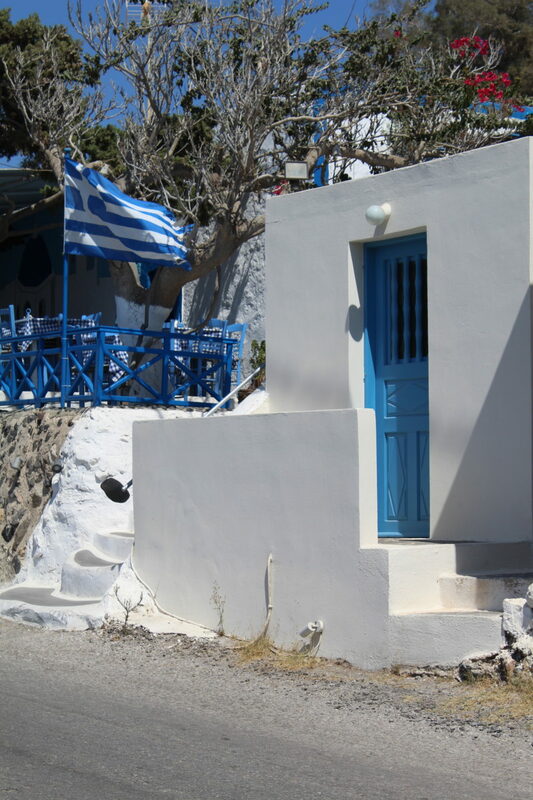 Argo – Argo is located in the heart of Fira. 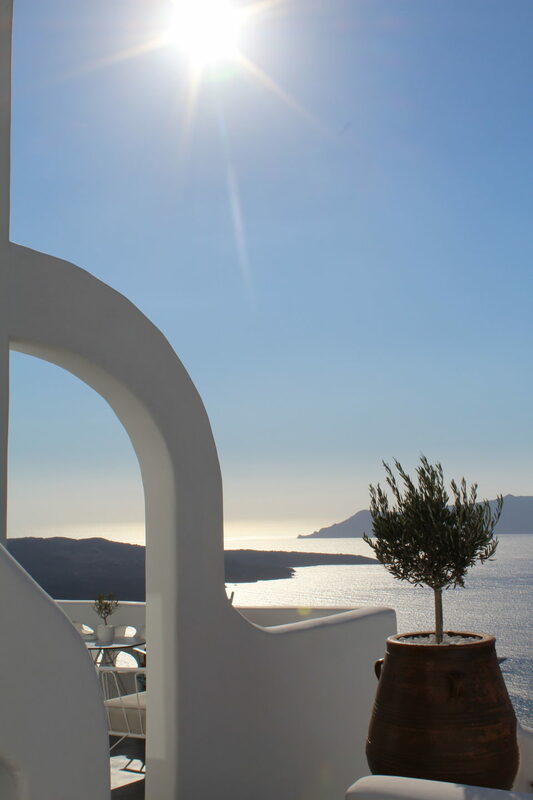 It is highly ranked by TripAdvisor as one of the top 10 in Fira. It has traditional Greek dishes as well as some innovative dishes like their version of “fish tacos” which you would not expect in Greece. My husband had them and the sea bass they used was cooked perfectly. He said it was one of the best meals he had the whole time we were in Greece. We started our meal (we started EVERY meal in Greece this way really) with a Greek salad that came with a big brick of fresh feta cheese. I opted that night for a vegetarian pasta that had sun-dried tomatoes in it which was very good. The ambiance is great. You climb up to the “first” level that during the day has views from the sea. As you make your way up to the upstairs (the 3rd floor) the arch way of the stair case is covered with beautiful flowers. It truly is a great place to stop if you are in Fira. Naoussa Tavern – If you want real deal traditional Greek food be sure to head to Naoussa. My friend who is 100% Greek swears by this place. I didn’t make it there the first trip but this time we were sure to stop by. Once again we started with tzatziki sauce which was perfectly seasoned. Not a ton of dill, lots of garlic and nice chunks of the fresh cucumber. My friends had the octopus to start and loved it. We actually took a break from Greek salads that night and had the arugula salad which our waiter told us was his favorite. It had nuts and apples in it but was not overly sweet. It was overly large though! Definitely a salad to share with the table. I was so excited that I finally found a restaurant with stuffed vegetables that I had to try them. My meal came with a tomato and a green bell pepper stuffed with an herb-y rice mixture that was flavorful yet light at the same time. (I preferred the tomato to the pepper). My husband had a traditional lamb dish that was equally as good. The lamb in Greece I do not find to be game-y and it was very juicy. If you are looking for authentic Greek food without the frills, this is your place. Omega 3 – This restaurant came as a VERY pleasant surprise to us. For our second trip to Santorini we decided to splurge a few nights and stay at the Ambassador Santorini. We got to our hotel later in the evening and really didn’t want to leave after traveling from Croatia all day. The hotel had a restaurant and you never really know what to expect. Hotel restaurants can be lack luster and over priced. We honestly weren’t expecting much we just knew we needed to eat. 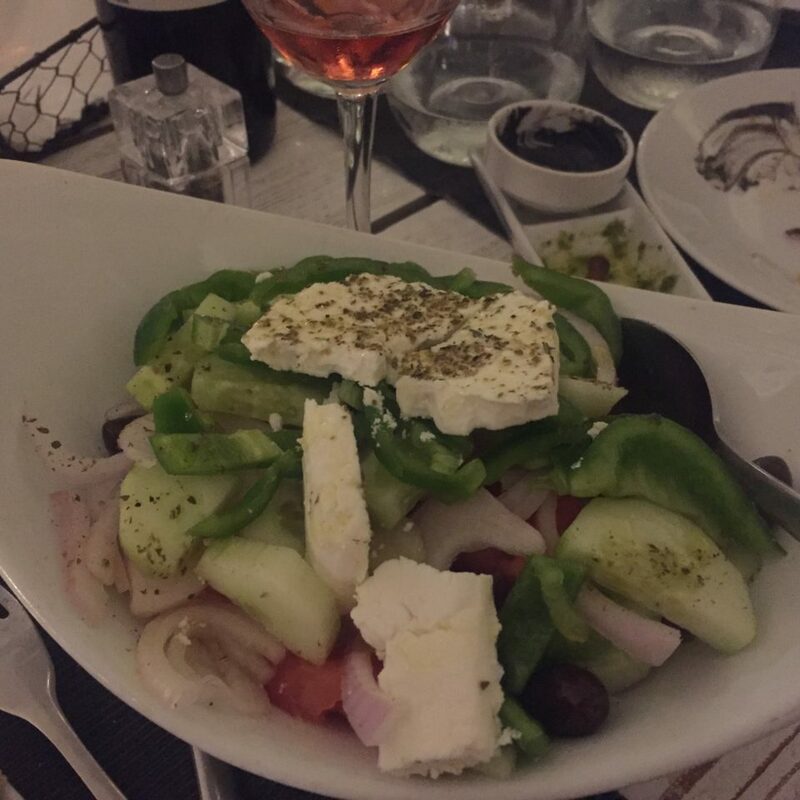 We started the meal with, yes, a Greek salad which had to have been the best one of our whole trip. The vegetables were so fresh and had so much flavor. They tasted like they were picked out of the garden that day. Instead of the traditional green bell peppers they used red ones in our meal. They also dusted the salad with toasted breadcrumbs which was an interesting addition to the traditional dish. We also ordered the fried potatoes. You would think these fried potatoes would just be basic but if you can make a fried potato gourmet – they did. These potatoes came drizzled with a goat cheese sauce and shaved prosciutto. The goat cheese sauce added a subtle tanginess to the dish which was complimented by the saltiness of the prosciutto. Our starters were so good we had the same exact thing for lunch at the pool the next day. For our mains we split the grouper and the pork cheek pasta. The pasta was homemade and cooked a perfect al dente. I don’t even like trying adventurous items like pork cheek but I had a bite and it was very tender. I have seen pork cheek come shredded into meals before but this pasta had 2 servings of the meat which was perfect because I could slide them over to my husband and eat the rest of the pasta. The grouper was cooked perfectly. We found that a lot of places tend to over cook the fish compared to places here in the US but this restaurant did not. It was a very pleasant surprise so if you are traveling near Akrotiri make sure you stop by. If you feel like splurging on one of the nicest hotels I have ever stayed at, the restaurant will just be icing on the cake. 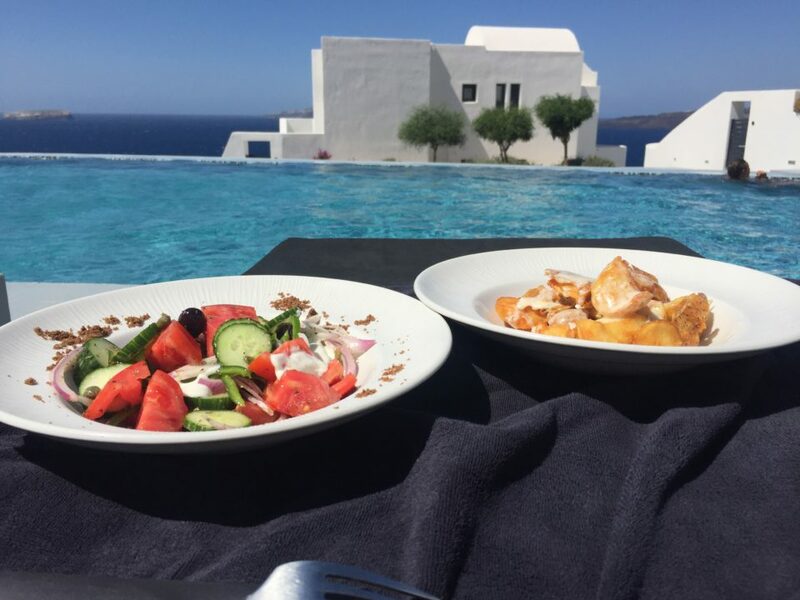 Kyprida – This was one of my favorite meals in Santorini. It was not because of the food it was because of the hospitality. We were wandering around in Oia during the day (our recent trip here) and stopped in a store to buy some artwork. We asked the girl working where her favorite places were that were less touristy. She recommended this place. 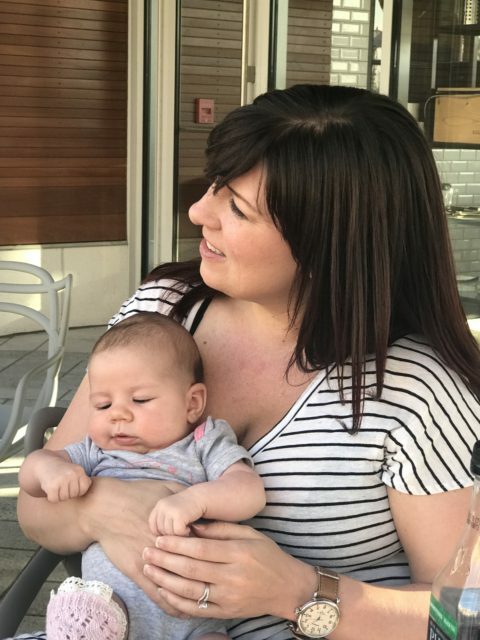 It was everything we love in a restaurant when traveling. It was not on the main streets and a little off the beaten path. We got there for a later lunch and were seated upstairs with a view of the sea. Our server was wonderful. After talking to Jean Luc for most of our lunch we found out he was a French man who married a Greek woman who swept him away from his corporate gig at Microsoft to move to Greece and start a restaurant. Kyprida had traditional Greek dishes and then their take on some Greek dishes as well. We started with tzatzki which was great but what was better was the complimentary feta spread he brought us for our bread. It was thin enough to spread and had red peppers blended into it. I had the Haloumi ravioli for my entree and it was really good. Haloumi cheese is a sturdier cheese that holds up to heat and doesn’t melt a lot but it was surprisingly good in the ravioli. It was not as runny and creamy as a ricotta but it was still really nice. They were topped with just a small amount of fresh tomato sauce. The wine selection he had was great too. We polished off a couple of bottles of Rose before we left. I would definitely go back to this spot if I was back in Oia and try more menu items (and learn more about Jean Luc!). Sunset Ammoudi Taverna – This place will always hold a special place in my heart to me. We had climbed down all the steps from the town of Oia to Ammoudi Bay. Down at the docks we were stopped and taking pictures with the sun setting in the background and my husband surprised me by dropping to his knee to propose. It was completely unexpected and such a special moment. After he proposed we were about 50 feet from Sunset Taverna where we walked in to have dinner. All the people sitting near the water witnessed what happened and were clapping for us. We had taken advice from a Greek man we met on the plane who told us to go down to the bay to eat and his advice did not fail us. Sunset was a great spot. Our first time in Greece it was probably one of the best meals we had. We went to the case where they had all their fish that they caught that day and split a fresh fish. When a restaurant is steps from the sea you can assume the fish would be fresh and in this case it was. Although I don’t remember much more about the meal from 2 years ago I do remember it was wonderful and the location was so unique. They also were nice and called for a cab to come meet us at the bottom so we didn’t have to climb back up all the steps in the dark after our meal. This is one worth checking out after the sunset in Oia.